Thanksgiving is a special time to gather together with family and friends and those that mean the most to us. The holiday was originally established by the Pilgrims in 1621 in order to give thanks for the blessings of the bountiful harvest and for the preceding year. Today, it is a national holiday in our country and it is a time to reflect upon our own blessings. 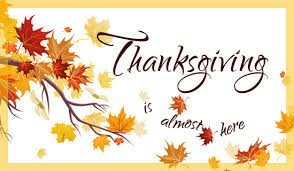 This year I am most thankful for my good health and that of my family and loved ones. I am also deeply thankful for the opportunity I have to serve my patients and be a part of their lives. It is the personal relationships that I share with my patients that mean the most to me. I truly enjoy getting to know my patients and their families. I like to celebrate their successes with them and learn along with them as they navigate school, work, leisure activities and other areas of interest. I never lose sight of the fact that people have a choice in their dental care and I appreciate the privilege of being their trusted choice! I make the most of the time I have with my patients and try to be present to them at every office visit. I love to hear about how they are doing and what is going on in their busy lives. It is truly gratifying to see their smile change and their confidence and self-esteem develop and grow stronger in the process. My hope for you this Holiday season is that you have a very Happy Thanksgiving filled with many blessings, laughter and fun.